Stubbornly high unem­ploy­ment rates got you down? Not sold on the eco­nomic recov­ery? Look no fur­ther than America’s polite neigh­bor to the north, where jobs num­bers are surg­ing and home prices have been ris­ing steadily for nearly a year. That’s what the Huffington Post wrote recently in Need A Job? Try Canada, Where Hiring Is Booming And Home Prices Are Rising. …as Americans con­tinue their gru­el­ing bat­tle over immi­gra­tion, Canadians have united behind a pol­icy that empha­sizes open­ing the door to tens of thou­sands of skilled pro­fes­sion­als, entre­pre­neurs and other pro­duc­tive work­ers who have played an impor­tant role in strength­en­ing the Canadian economy. So per­haps it’s not sur­pris­ing that older, well-​​educated immi­grants are increas­ing choos­ing to come to Canada, rather than the U.S.
And that same poll reported that almost one-​​third (30%) of Americans would choose to relo­cate to Canada, if they could. 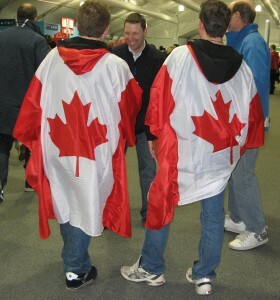 Nearly 80 per­cent agreed that Canadians enjoy one of the best qual­i­ties of life any­where in the world. Most respon­dents (72%) believe that Canada is wel­com­ing to immigrants. Eight in ten respon­dents describe Canada as being tol­er­ant of peo­ple from dif­fer­ent racial and cul­tural backgrounds. What do you think? Have you relo­cated to Canada for work? Are you think­ing about mov­ing to Canada for eco­nomic rea­sons? Leave a com­ment and let us know. I am a 28 year old girl from Italy with a Master Degree in Translation (from Italian to English and vicev­ersa) and I would like to move to Canada (Vancouver or Calgary)looking for a job in Translation field. I don’t know how to look for a job. Can any­body help me? If you do want to look for library career oppor­tu­ni­ties in Canada, check out the Canadian Library Association site (www​.cla​.ca), espe­cially the Job Search page and the page about rec­og­niz­ing Foreign Credentials. Your idea about buy­ing a vaca­tion home — or just com­ing to Canada for six months — is another rea­son­able approach. If you’re an American cit­i­zen, you can come to Canada as a vis­i­tor for up to six months a year. That way, you can decide if you like it before mak­ing a more per­ma­nent com­mit­ment. It would also be eas­ier to make local con­tacts and net­work for job pos­si­bil­i­ties if you’re phys­i­cally located in the area where you’d like to live. Good luck and let us know how you’re doing! Yes, I am think­ing about it quite seri­ously. But so far the Immigration Canada web­site gives me the strong feel­ing that I don’t qual­ify: My cur­rent pro­fes­sion isn’t in a “hot” skill (I was a librarian/​archivist; I lost my job in the bad econ­omy…), and I have absolutely no ties to Canada otherwise. I’ve also trav­elled to and lived in Europe, so I’m also apply­ing to go there. I’d be grate­ful for any suggestions!